Our own Julia Haslanger (@JuliaJRH) has written two great pieces on Medium that offer some useful insights into how journalists can cover important, emotional events in ways that engage community voices. The first looks at how three St. Louis newsrooms made the Ferguson story easy to follow and invited community members to share their stories. The second looks at how jouranlists can avoid burnout when covering stories like this. 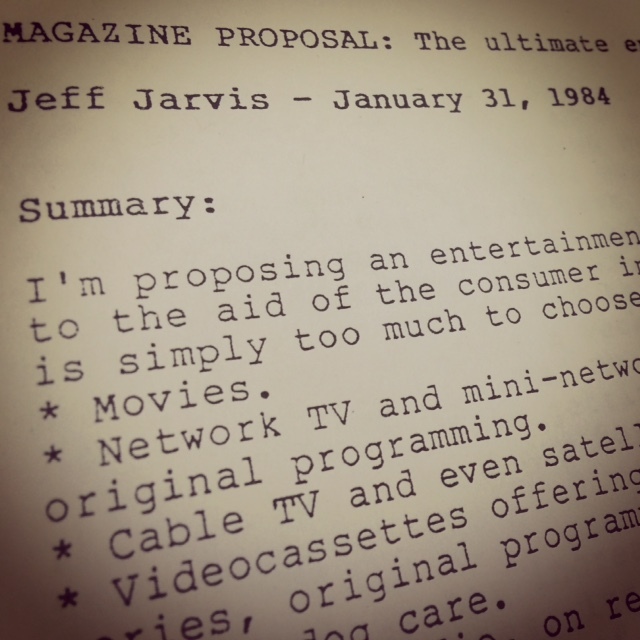 In class this week we took a stroll down memory lane with professor Jeff Jarvis as he walked us through his time at Time Inc., from his work at People to building a brand new magazine, which would eventually become Entertainment Weekly. Entertainment Weekly was born out of a need that existed in the mid ‘80s. For the first time, audiences had an abundance of choices when it came to entertainment, and they began fragmenting. Editors were once the gateway to the public for celebrities, but that changed. PR suddenly had the power because they had access to the celebrities. This became a problem for some publishers. However, there was a solution. Or rather, an opportunity that Jarvis discovered. The opportunity was to concentrate on the product rather than the celebrity; concentrate on the program rather than the people. A new editorial product like Entertainment Weekly would consist of reviews, some features, some news and gossip, information about new equipment, and lists. Although the initial pitch for the magazine was rejected, four years later, the beginnings of Entertainment Weekly began to take shape. 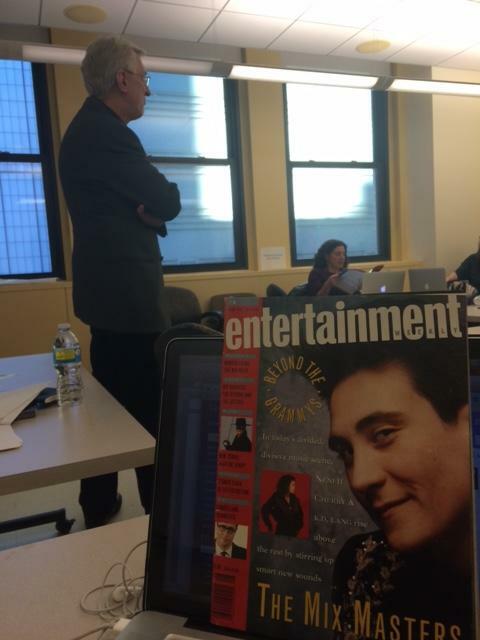 In class we discussed what it took to get the magazine off the ground. We discussed everything from market analysis, competition, various plans (product, revenue, marketing, ops, launch) and finally capital needs. In essence, a business plan. We also discussed circulation, advertising and revenue. Here’s a look at the top 12 U.S. Consumer Magazine Publishers: Circulation & Advertising Revenue. 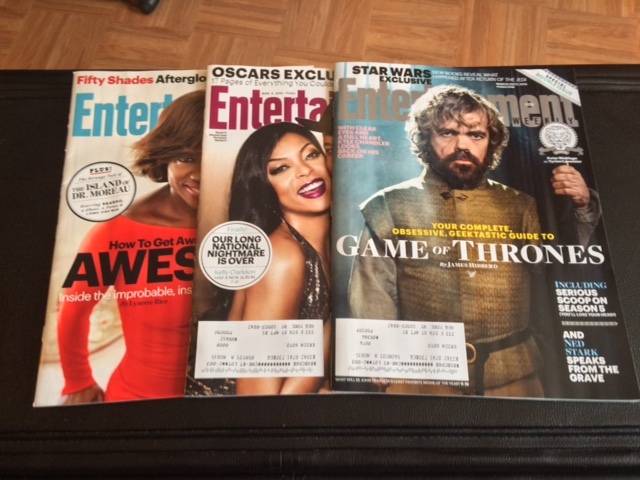 We learned that in the end it took $200 million before Entertainment Weekly broke even. Despite subscriber acquisition costs (the amount of marketing you need to spend in order to get a subscriber) and general business expenses, the mass media model based on advertsing worked for magazines. However, things operate differently today. Jarvis also talks about the value of readers and offering rewards in the future. He suggests a “pay down” system, in which readers can pay a deposit to access content the first month, then each month after that they can earn back the fee by doing things such as coming back often to see ads, sharing demographic information, and buying products from the publisher, to name a few. The way we consume content has changed drastically and continues to change. We were asked what a great news world would look like to us now. Some of our responses were: having less click bait (content whose main purpose is to attract attention and encourage visitors to click on a link to a particular web page) and having more control over the news we receive (being more relevant to our individual needs). There are many ideas we can come up to improve our future news experience, but I want to go back to one of the discussions we started in class. How can each of us either turn our community project into a business and/or profit from it? Think about your elevator pitch. What’s the problem you’re solving, and what is the value? Offer ideas to other classmates if you have suggestions. 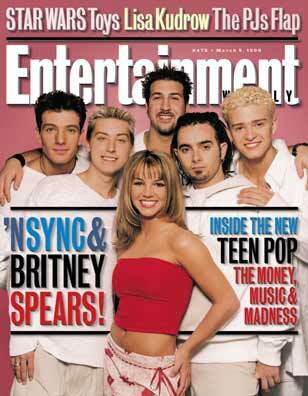 I’m officially concluding this post by saying Entertainment Weekly was the first magazine I ever subscribed to. I was in high school and purchased the magazine from a door-to-door salesman. Here is the first issue I remember receiving. I actually still subscribe to the magazine today. I even have proof. Needless to say, I really enjoyed this particular class discussion. In this past week’s class, we received a great lecture from Dr. Lisbeth Berbary. Her research and work has some valuable lessons we can apply to our communities. I found her methodology and subject matter really interesting; by studying students in Greek life at a large southern university, she explored a community that isn’t often looked at with an academic gaze. Despite the fact that Dr. Berbary approaches her work with the lens of an academic (which I also hope to do upon graduation from CUNY), there’s quite a bit to be gleaned as journalists from the way she looks at her studies. Sometimes the best way to get to know the community you’re working with is to just be there. By this, I mean being present at community events and functions, and generally serving as an advocate for these groups. But in this week’s readings and last week’s discussions, I came across a really interesting point. What if these communities aren’t physically there? What if they’re online? With the rise of the internet, these “virtual communities” are all over. My favorite example of this is Reddit. If you’re not familiar with Reddit, go give it a spin. There’s a sub-reddit thread for quite honestly everything you can think of. It enables groups of people who share common goals and interests to connect with one another and have discussions about the subjects they’re passionate about. Every one of us has the capability to reach an audience or become a part of a community with the devices in our pockets; it’s the tactics we use that set us apart as journalists. Does your community have an online meeting place? How have they used new media to communicate? This week in class we heard from two guest speakers, looked at some thought-provoking charts and discussed how we think of advocacy and bias within the new realm of social journalism, and specifically as we work with our communities throughout the year. Sandeep Junnarkar and Allegra Abramo stopped by our class to talk with us about their “Stop the Mold” series. It was enlightening to hear about their process of going into the community, identifying leaders and building connections with the people whose lives were affected by mold. Having the stamp of approval from trusted community organizations or individuals (such as relevant beat reporters) helps a lot. Sandeep says each time they met with an organization they had to build trust. They would go to the organization, sit down with people and show clips of the kind of work they’ve done and answer their questions. Having your elevator pitch ready helps build trust. If people are mistrustful, try to learn why. What are their concerns? Learn how to avoid the minefields (rivalries between people and groups, etc.) and focus on what you’re covering. It can be slow going. “For the longest time in this class, we had nothing to show,” Sandeep said. The next step for the “Stop the Mold” project is to try to provide information and instructions to the people who have mold, and teach them how to document their situation. Jeff Jarvis says that’s great community journalism: “The way to really do it is having a community really depending on you for information. Sandeep underwent a period of transition from being what he called as a “taking” journalist to a community-focused, “sharing” journalist. Also within the last 10 years, he says he went from being very “balance” focused to acknowledging that he has an opinion and wants it heard. Don’t be afraid to apply for grants that aren’t a perfect fit. It’s OK to “hack” the grant, especially for projects you’re passionate enough about that you want to do them regardless of whether you get the grant or not. For the second part of the class, we turned our attention first to three charts about engagement, then to a discussion of challenges and principles of social journalism. First we looked at a chart by Peggy Holman about different levels of engagement. Carrie Brown suggested many newsrooms only make it halfway across the continuum, to the “involve” level, allowing readers to comment, but not to “collaborate” or “empower” levels. This chart is so simple and so valuable to explaining engagement concepts to more old-school journalists. I remember when I first saw that drawing from Joy, five or more years ago, and it’s stuck with me ever since. It looks at opportunities for a journalist to become interdependent with the community he/she is serving. 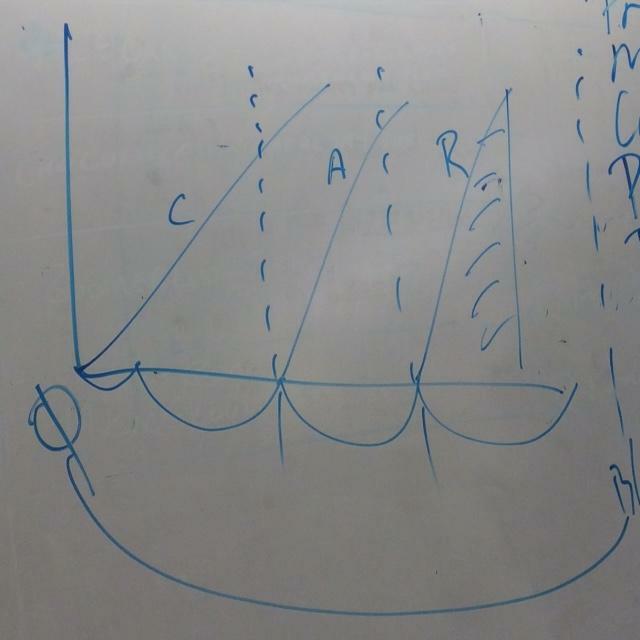 With those charts and the lessons we heard from Sandeep and Allegra in mind, we began a conversation about advocacy journalism, and what the challenges we’ve encountered so far or expect to encounter. One challenge mentioned was juggling when to use the language of your community, even if those outside it don’t get the jargon. When is it OK or good to use abbreviations, acronyms and other shorthand, and when do we need to explain terms to a general audience? Jarvis pointed out that by using the language of your community, you’re demonstrating that you’re an insider. You’re writing for “a public” rather than “the public,” as Jarvis put it. Figuring out which you’re working with and for can be troublesome as times. “Facebook confused being public with your public to being public with the public,” Jarvis said. Once you figure out how to talk to people, and once you start becoming immersed in your community, how do you recognize where “the line” is? Jarvis also prodded us to identify what would be the moment you know you’ve lost your independent perspective. We brought up lying, falsifying or hiding facts. Cristina put it nicely: You have to cover everything, not just what you want to cover. Carrie then asked us to consider biases, and then wanted us to think about what biases are generally accepted in journalism, such as, “lynching is bad,” or “crime is bad.” But Carrie said the biases you don’t know you have are the most dangerous. An exercise that I did in undergrad that was really helpful in identifying my own biases and perspective is called “Fault Lines,” I highly recommend checking it out. Carrie also referenced the work of Bill Kovach and Tom Rosenstiel in “Elements of Journalism.” Bill, Carrie said, made the point that watchdog journalism clearly has a form of bias — it’s pointing out something that’s wrong. You wouldn’t be writing the story if everything was fine and nothing needed to be changed. If you could propose one item for an early draft of “Principles of Social Journalism,” what would you propose and why? Try to suggest something different than the commenters before you. Guided by the principles of Design Thinking, our community engagement class project led us to listen to the experiences of the NJ Transit commuters waiting for their trains at Penn Station. The goal was to prototype tools that NJ.com can use to serve this community. Professor Jeff Jarvis’s social journalism book, “Geeks Bearing Gifts,” challenges us new-age journalists to measure success by outcomes and to forgo chasing clicks.. To immerse ourselves in communities, not just to report on a catchy breaking story, but to build meaningful relationships and build tools for connectedness. This exercise was one example of how this can work. It’s these approaches that put a journalist and the community they serve on the same level. As service-based journalists, Doreen Marchionni explains, it’s key for our communities to gain a sense of our “humanness.” We no longer report from above, but from on the ground, at eye-level. And we report not just to create content, but also to affect change and deliver outcomes. I think of Brandon Stranton’s Humans of New York blog as an example. Stanton connected a community of millions of people worldwide who are interested in the everyday experiences of regular people. The interest in the compelling stories of the ‘humans’ often generates crowd-funding campaigns to alleviate the struggles of the interviewee. For example, a cash-strapped middle school in East New York, Brooklyn raised over one million dollars to start a yearly program that sends students from low-income families to visit Harvard’s campus. How can we serve NJ Transit commuters? First, we must find what their troubles are. The current commuter experience is one riddled with last-minute track notifications and delays, extending already long travel times. To interact with commuters, we visited them where they wait, and we drank the morning-equivalent of margaritas, coffee. The mood may not have been festive at Penn Station during the morning rush, but we had valuable conversations with commuters. After talking with the commuters, our class exchanged experiences and reflected separately this week on how to further develop relationships with our own communities. My community I originally sought to engage for the social journalism program was defined by the geography of Greenpoint, a neighborhood that’s home to the polluted Newtown Creek and a host of environmental health problems. As I continued to develop relationships and dig deeper, I found a more-focused community of entrepreneurs, scientists, and students working on technologies to report on air quality using sensors in San Diego and Brooklyn. I’ve found that refocusing one a smaller subset of a greater community makes engagement more feasible. Professor Jarvis said to find forums where people are communicating, and most importantly, “listen first.” Listening is often easier said than done; to approach a community with a preconceived notion can be detrimental. An approach to to creating products and services the community needs is “to continually source feedback and then reevaluate,” Professor Carrie Brown said. Immersion, listening, and re-evaluation are central tenants of service journalism and design experience alike. Lamar Graham is the vice president of audience development for NJ.com. He visited class this week to receive our insights on the commuter experience and give feedback on the tools we developed. We explained to Graham that after fielding many opinions, we learned that commuters want WiFi, power outlets, cleaner and more-spacious seats, and better train notifications, with alternative routes. Some of these structural accouterments are clearly out of reach for NJ.com to provide on trains, so our proposed solutions instead hinged upon social tools and mobile phones. The prototyped tool each group came up with centered on the use of a hypothetical smartphone app. The idealized NJ.Com app would provide train notifications and news updates for trains, generated in significant part by users. The notion of a community reporting on itself fits within the social journalism approach, and frees us journalists to curate the content and make the exchange of community knowledge efficient. There was a consensus that the app should have a certain social aspect that connects riders, if not in-person, then on message boards and comment sections within the app. According to Graham and Jarvis, who are both NJ Transit commuters, interaction with other riders is rare, much like on the NYC Subway. Many times it seems improper and uncomfortable for two strangers to start talking on public transit, and there has to be a prior commonality to ease social apprehension. Where better place to start than from a place of shared disdain for the daily commute? Commuters are in close proximity on the NJ Transit and remain disconnected from one another, at least for now. Looking forward, I want to ask: how are we developing relationships with our respective communities? What are our challenges and successes so far? How can we use the insights from the NJ Transit research in building our own communities? Did you buy a margarita-maker yet, or practice making them?